This week, the House passed a resolution not to co-operate with the Controller and Auditor General. 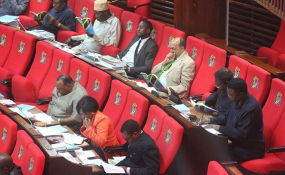 Dar es Salaam — The Controller and Auditor General (CAG) Prof Mussa Assad has finally opened up, saying he is ready to appear before the parliamentary committee as ordered by the Speaker of the National Assembly Mr Job Ndugai. However, the CAG has expressed his disappointment with what he termed as, "what is going on." He said during a press conference on Thursday January 17 that his office was both "disappointed and not pleased at all." This comes barely a week since the speaker, Mr Ndugai summoned Prof Assad to appear before the Parliamentary Privileges, Ethics and Powers Committee over claims of disrespecting the parliament. Speaking in Dar es Salaam today, the CAG, Prof Assad, said that his office still enjoys a close and fruitful relationship with the parliament which is based on constitutional mandates and promised to face the Bunge committee. "On January 15, 2019, I received a summons to appear before a parliamentary committee on January 21, 2019. On the basis of maintaining the good working relationship the office of the CAG has with parliament I'm willing to do so," said Prof Assad. Copyright © 2019 The Citizen. All rights reserved. Distributed by AllAfrica Global Media (allAfrica.com). To contact the copyright holder directly for corrections — or for permission to republish or make other authorized use of this material, click here.